The Buckeye State is home to some beautiful waterfalls, many of which are set within national and state parks and can easily be reached on pleasant hiking trails through the wilderness. 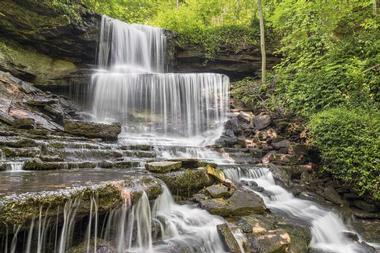 From the incredible horseshoe-shaped cave of Ash Cave Falls to Rockbridge Falls, which flows beneath the longest natural bridge in Ohio, there are a wealth of beautiful and unique waterfalls, hiking trails, and scenic landscapes to enjoy around the state. 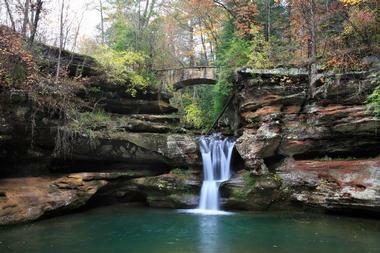 Here are some of Ohio’s most striking waterfalls. 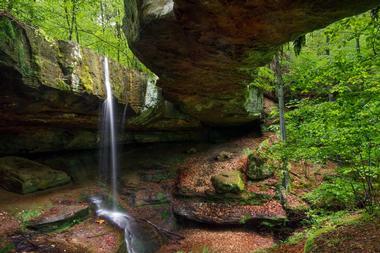 Ash Cave Falls is a 300-foot seasonal waterfall in Hocking State Park in southeastern Ohio. The waterfall only runs in spring after the rains, plummeting dramatically over the rim of the most significant recess cave in the state and is best seen in April as it freezes into an ice column in the winter. The falls cascade from the rim of Ash Cave, a 700-foot-long horseshoe-shaped recess cave that is 100 feet deep and 90 feet high, and was named for the fact that early settlers found huge piles of ash left behind by the Native Americans. Even if there is no water flowing over the rim, Ash Cave is an impressive sight and worth a visit. Berea Falls is a small urban waterfall in the Rocky River Reservation in Berea, Ohio. 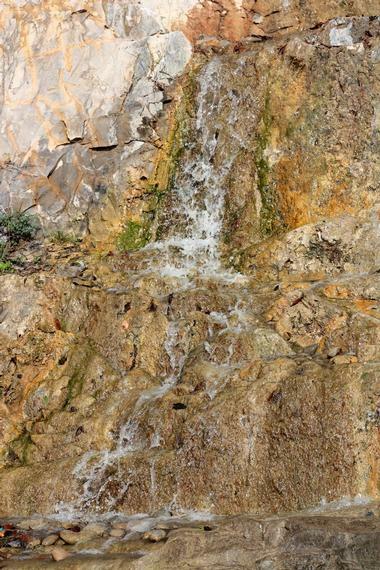 The relatively small waterfall is only 25 feet in height and consists of two main drops and some more minor drops that cascade down a gentle slope. While not the most scenic waterfall in the area, there are three bridges above the falls that are worth a visit and offer lovely views, as well as several other waterfalls to explore. 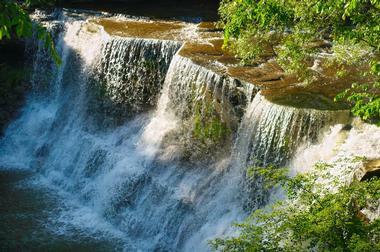 Berea Falls can be reached from Valley Parkway, which can be accessed from the I-71 off the Bagley Road exit. 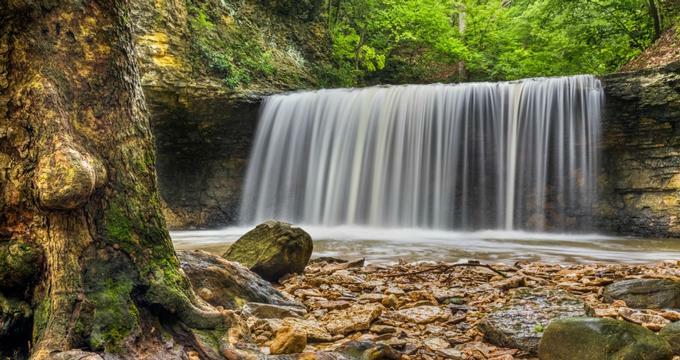 Located in Cuyahoga Valley National Park just south of Cleveland, Blue Hen Falls is a small waterfall of only 15 feet with a 5-foot crest that makes for an enjoyable scenic hike. The surrounding park has lush vegetation and plenty of wildlife to view, and there are two other waterfalls just downstream from Blue Hen Falls that are also worth a visit – the beautifully scenic Buttermilk Falls and the Brandywine Falls. 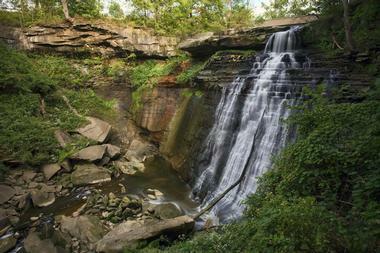 Blue Hen Falls can be reached from Boston Mills Road and maps are available on the Cuyahoga Valley National Park’s website. Brandywine Falls is located in Cuyahoga Valley National Park and has one of the most impressive cascades in the Lake Erie watershed. 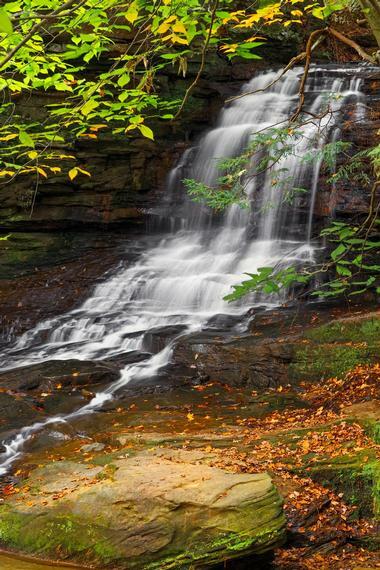 Boasting a height of over 60 feet, the scenic waterfall is one of the highlights of Cuyahoga Valley National Park and is easily accessed from Brandywine Road. Resting along the Cuyahoga River, Cuyahoga Valley National Park features lush vegetation and natural landscapes along with a diverse variety of birds and wildlife, which can be viewed when visiting Brandywine Falls. 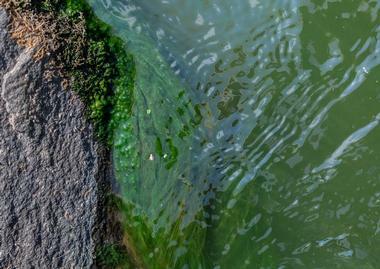 The park is home to the Ohio and Erie Canal Towpath Trail, a restored section of the canal's original towpath, and the Canal Exploration Center, which has an array of exhibits about the 19th century waterway’s history. 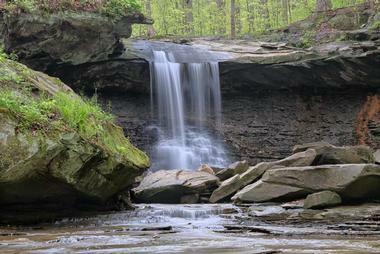 Buttermilk Falls is a beautiful scenic cascade tucked away in a secluded glen within Cuyahoga Valley National Park. Set on Spring Creek, the beautiful falls can be reached on an easy 20-minute hike that also passes Blue Hen Falls along the way as well as a diverse variety of fauna and flora. Downstream from Blue Hen Falls, Buttermilk Falls is accessed by a rough trail that crosses the stream three times, however, there are no bridges, so some rock-hopping is involved. 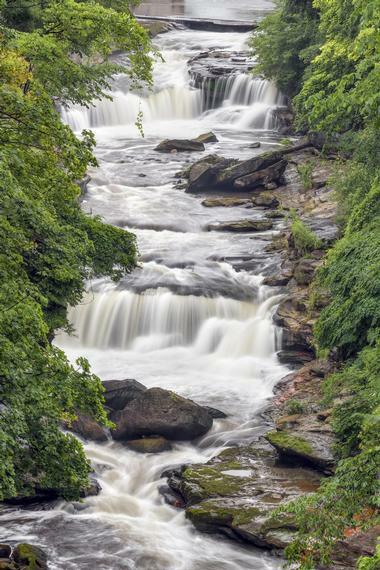 The park is also home to the 60-foot Brandywine Falls, which boasts a height of over 60 feet and is one of the highlights of Cuyahoga Valley National Park. Set on Crystal Creek in Nelson & Kennedy Ledges State Park, Cascade Falls is a delicate waterfall that cascades down the face of one of the Nelson Ledges, which makes for an interesting visit. While the waterfall tends to dry up in the hot summer months, the ledges themselves are worth a visit, with scenic sandstone formations and can be reached by several accessible hiking trails. Cascade Falls can be reached from Route 282, and there is a parking lot and picnic area on one side of the road, from which several hiking trails lead through narrow crevices in the rocks to the falls. 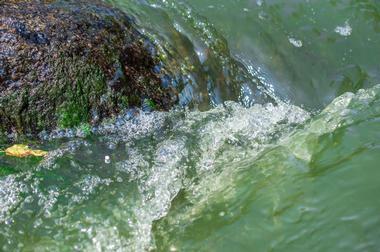 Nelson & Kennedy Ledges State Park is situated next to the watershed divide between the Ohio River and Lake Erie. 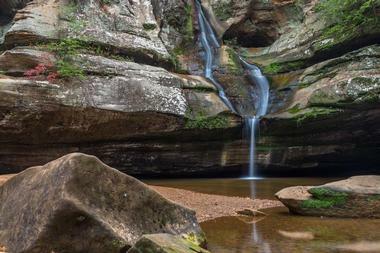 Set within Hocking Hills State Park in southeastern Ohio, Cedar Falls is a 50-foot waterfall fed by Queer Creek and has one of the most impressive and most reliable cascades in Hocking Hills. A popular site with locals and visitors, Cedar Falls slides down a massive section of sandstone, splits in the middle, and then converges again before plunging into a tranquil pool. The unique looking waterfall has a large rocky beach-like area at the base of the falls, which makes for a beautiful and relaxing spot for picnics and days out with the family. Cedar Falls can easily be reached by a trail leading a parking area next to the SR 374 that leads down into the gorge and to the falls. 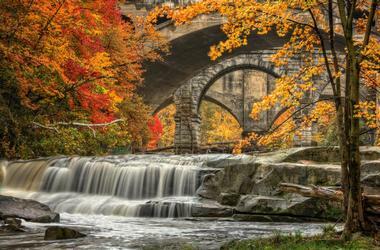 Chagrin Falls is an urban waterfall with a height of 20 feet that is located in the heart of the town of Chagrin Falls. Set right next to an ice cream shop and very easy to visit via a lovely boardwalk, Chagrin Falls is fed by the Chagrin River and has a little bridge above the cascade with a small dam upstream of the bridge. 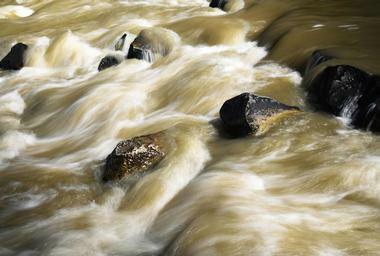 Situated about 25 miles east of Cleveland, Chagrin Falls is named for the river from which they are fed, which was apparently named after the French trader Francois Séguin. Named for the Charleston Falls Preserve in which the falls are situated, the Charleston Falls is a 37-foot waterfall that is nearly as wide as it is tall. 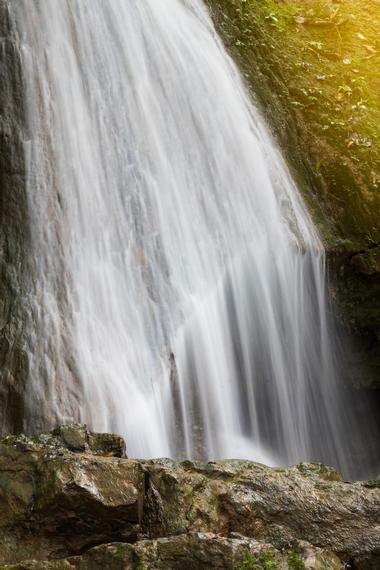 The waterfall is fed by Charleston Creek, which has cut a deep and rocky gorge on its way to the Great Miami River and is unusual for the mostly rolling farmland landscapes of Ohio that surround it. The falls are at their best after a good rain, and the waters flowing down the gorge make for an impressive sight. The falls can be reached by several trails leading down into the ravine to the base of the falls, and there is a bridge and viewing area below the falls where beautiful photographs can be taken. The Clifton Gorge Falls are located in the 269-acre Clifton Gorge Nature Preserve near the town of Clifton in southwestern Ohio. Created by the Little Miami River racing through a rocky gorge carved from limestone and along a diverted man-made channel, the Clifton Gorge Falls is a pretty waterfall next to the historic Clifton Mill, which features the old waterwheel, a scenic wooden covered bridge, and several landmark buildings. Clifton Gorge Falls can be reached by the Narrows Trail, which begins just west of the mill and follows the rim of the gorge, boasting stunning views of the rapids below. Set on the Cuyahoga River in the Cuyahoga Valley National Park area, the Cuyahoga Falls are made up of two falls, namely the Big Falls, which are located behind a dam, and the Little Falls, which can be found in the town of Cuyahoga Falls. The Little Falls can be reached via an old bridge at the end of Prospect Avenue, from which lovely but distant views of the falls can be seen along with beautiful views of the gorge downstream of the falls. Known as Coppacaw Falls by the Native Americans, the remnants of the Big Falls are located just a mile south of the Little Falls in Gorge Metropark and can viewed from a trail that follows the edge of the gorge to a lookout of the dam. 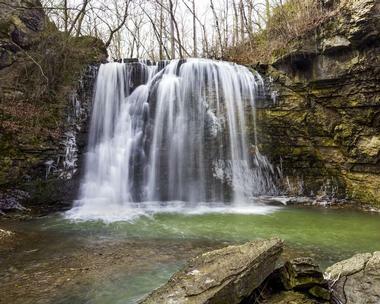 Set on Clear Creek in the Fallsville Falls Wildlife Area in Clinton County, Fallsville Falls is a 15-foot waterfall surrounded by pristine landscapes and reached by an easy half-mile walk. 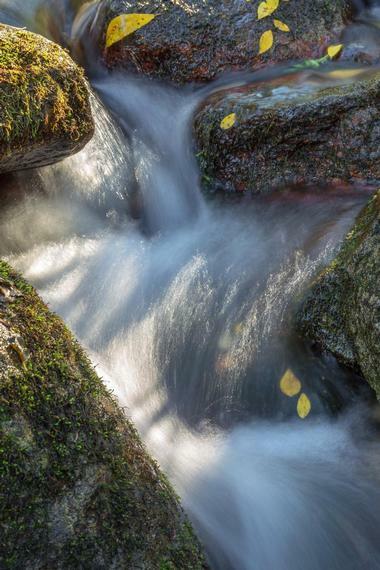 Named for a town that no longer exists, the waterfall is hidden away in a small wooded gorge in an area of mostly farmlands and is reached by a trailhead on Carytown Road, south of Carytown and north of Hillsboro. The unsigned trail follows the road for about a quarter of a mile and then leads into the woods and down the gorge. Greenville Falls is a low and wide 20-foot waterfall set in the Greenville Falls State Natural Area and surrounded by rolling farmlands in Miami County in Ohio. Fed by Greenville Creek, Greenville Falls gradually drops 20 feet in two drops of about 50 feet wide and into a distinctive and impressive gorge. Unlike many of the falls in the area, Greenville Falls has running water for most of the year and can be reached by a short set of trails that leads to an overlook above the falls from a parking area off Rangeline Road. Located in Griggs Reservoir Park on the west side of the Scioto River, Hayden Falls is a 25-foot waterfall fed by the Hayden Run and set in a wild-looking and gorgeously scenic little gorge. Not very well known until recently, the deep ravine was carved by the Hayden Run on its way to the Scioto River and together with the falls is a lovely spot to explore. Hayden Falls can be reached via a stairway down into the gorge from a parking area on the south side of Hayden Run Road. 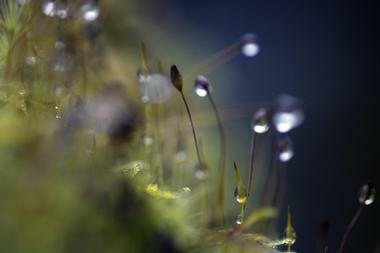 There is a boardwalk near the base of the falls that offers excellent views. 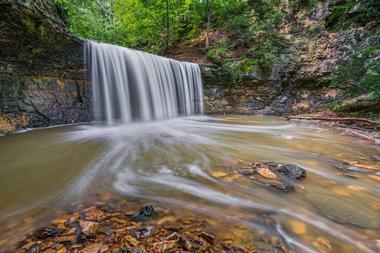 A small scenic waterfall in Knox County, Honey Run Falls is a 15 to 20-foot cascade fed by the Honey Run and the centerpiece of Honey Run Waterfall Park. Situated close to the point where the reasonably short creek of the Honey Run empties into the Kokosing River, Honey Run Falls can get very thin in drier weather and is best viewed after the spring rains. The falls are easily accessed from a trail that leads from a small parking area off Hazel Dell Road down through the gorge to the river and the falls. 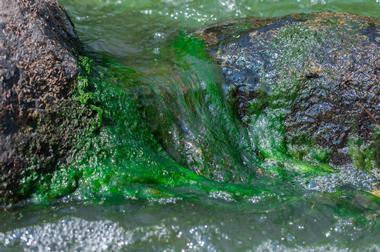 When the creek and the falls are in full flow, the gorge trail is impassable. Indian Run Falls is a small urban waterfall in a city park in Dublin, Ohio. Set within a broad but beautiful gorge, the 20-foot waterfall is fed by Indian Run Creek and is quite challenging to get to as access to the canyon is restricted. Indian Run Falls plunges about 15 feet high down a steep cascade with smaller cascades below it and can be viewed by a trail that runs along the edge of the gorge. The gorge is spanned by a bridge below the falls, which unfortunately has been closed since 2008. 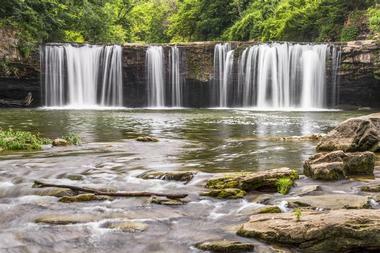 Indian Run Falls is located from Shawan Falls Drive in Dublin, which is northwest of Columbus. Lanterman’s Falls is a dramatic 15-foot plunge falls in Mill Creek Park on the outskirts of Youngstown that is fed by the Mill Creek, which is still used to operate a grist mill. When the creek is high enough, it is still used to power the mill to grind grain, which features a beautifully restored old waterwheel and a beautiful wooden covered bridge. While the falls themselves are picturesque, the deep rocky gorge below the falls is even more beautiful, and both can be reached by a short walk from a well-signed parking area on the north side of the creek. The trail leads down into the gorge from the mill to an overlook with charming views of the falls and the mill. Located in the town of the same name, Ludlow Falls is a large 15-foot plunging waterfall that is hidden under a highway bridge and very impressive when the water is flowing. 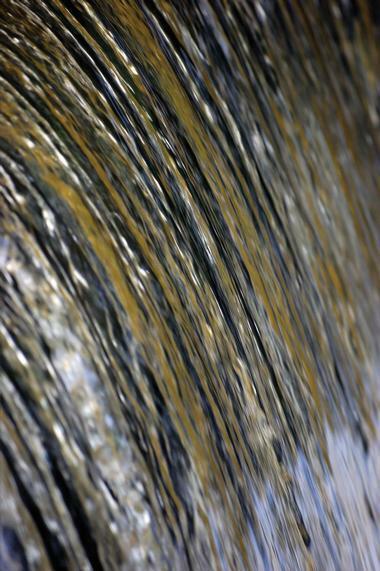 The waterfalls are fed by Ludlow Creek, which runs along Covington Avenue in the heart of town and cascades directly under the Route 48 bridge, where the waterfall is situated. The falls are easily accessed via a short walk through a park on the north side of the creek in Covington Avenue but need to be looked for carefully as they cannot be seen from the road. An old stairway runs down into the gorge for those who want to explore, and the falls can also be seen from the south side of the creek, however, the views are slightly obstructed by trees. Lyons Falls are a pair of low flow falls with 80-foot and 25-foot drops, respectively, that are situated on a 2-mile loop hike in Mohican State Park. The falls, named Big and Little Lyons Falls, are fed by small streams that flow into a magnificent 1,000-foot wide and 300-foot deep gorge, around which the park is centered. Big Lyons Falls drops 80 feet over a recess cave surrounded by spectacular sandstone cliffs and is very impressive after heavy rains. Little Lyons Falls is a smaller waterfall with a 25-foot drop into a narrow gorge, whose rocks have collapsed into the stream, making it more difficult to explore on foot. Both the falls can be reached on the relatively easy 2-mile loop hike, which starts at the covered bridge and follows the Clear Fork upstream, passing the two falls. Fed by Mill Creek within the city limits of Cleveland, Mill Creek Falls, also known as the Cataract Falls of Mill Creek, is a lovely 45-foot waterfall that offers a pleasant escape from the hustle and bustle of the city. The urban cascade is surrounded by a small park with a history center and has two observation decks from which partial and full views of the waterfall can be enjoyed. Mill Creek Falls can be reached from Warner Road or by parking at the Garfield Park Reservation and walking for 1.5 miles to the falls. Mill Creek Falls are at their best after the spring and winter rains and tend to dry up in the hot summer months. 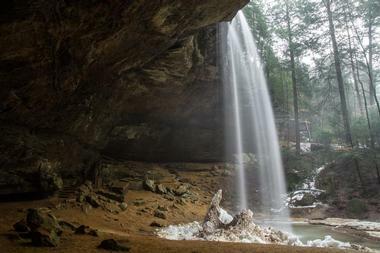 Set within Hocking State Park and named after the large recess cave in which Richard Rowe took up residence in the 1800s, Old Man's Cave is a 15-foot-high waterfall in a deep gorge that can be reached by a favorite hiking trail. The Upper Falls can be found at the east end of the ravine, which has several unusual caves and recesses that have been carved out by the creek over centuries, as well as several smaller drops and cascades further down the gorge. The trail follows the canyon, crossing bridges and winding through a tunnel, and leads to the Old Man's Cave as well as the second cascade, which drops 25 feet into a large pool. The trail then leaves the gorge via a series of stone and wooden stairs, passing underneath a seasonal waterfall, and then up through a tunnel to the rim. Paine Creek Falls is a two-tiered waterfall near the shores of Lake Erie that makes for a pleasant, scenic spot for those traveling between Buffalo and Cleveland. 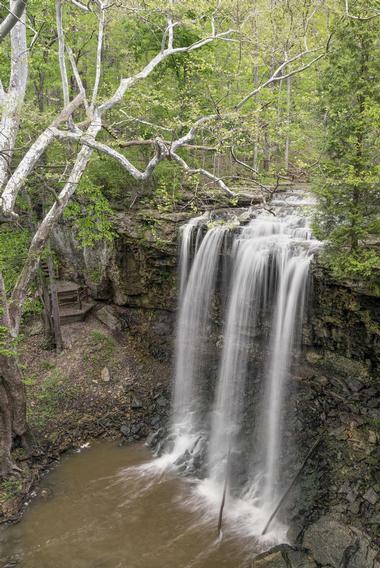 Located about 5 miles southeast of Painesville and fed by Paine Creek, the 25-foot waterfall, once named Bakers Falls, can be found in a small metro park with picnic areas, grills and restrooms, and a hiking trail that skirts the rim of a gorge with beautiful views. The park in which Paine Creek Falls is situated can easily be reached about half a mile off Paine Road just past the bridge. Aptly named, Rockbridge Falls is a unique and lovely cascade that flows beneath a natural bridge in the Rockbridge State Nature Preserve and is best seen in April or after some really heavy rain. Located in the town of Rockbridge, the waterfall has a drop of around 40 feet and is worth a visit due to the impressive natural bridge under which it flows, which is 40 feet high, 3 feet thick, and 90 feet long, making it the longest natural bridge in Ohio. 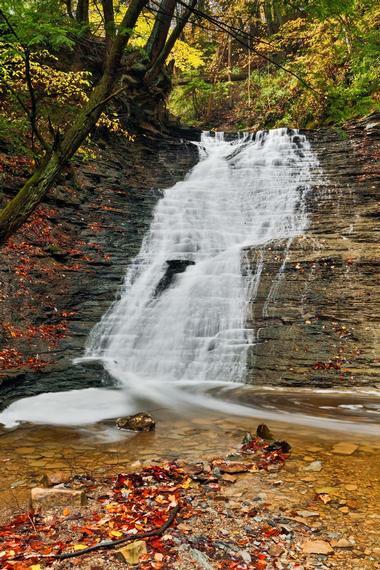 The falls can be reached by a 30-minute walk along a trail in the preserve, which winds through farmland and hilly wooded landscapes before descending to the falls. Adventurers will enjoy visiting this waterfall as it’s about as wild as you can get. As the name implies, Sheepskin Hollow Falls is beautifully wild 15-foot plunge waterfall in the 453-acre state nature preserve of Sheepskin Hollow in Columbiana County. Fed by the Sheepskin Hollow Run, the wild low flow falls can be reached by a creek walk, but there is no signage and a bit of bushwhacking is involved. Located about 10 miles south of East Palestine, Sheepskin Hollow can be reached by parking next to the road on Pancake Clarkson Road just past the north fork of Little Beaver Creek and climbing up to the old abandoned railroad. Head south and Sheepskin Hollow will be on the left after about half a mile. Located in the heart of the quaint village of West Milton in Miami County, West Milton Cascades is a pretty little multi-tiered cascade that is fed by the Stillwater River. The falls have a drop of about 20 feet with a 5-foot crest and can easily be reached from both State Route 48 (Main Street) and State Route 571 (Tipp). The falls have two main drops, which flow into a series of smaller cascades further down the slope and finally into the Stillwater River. West Milton Cascades can be viewed from an overlook at the top of the falls, and a stairway leads down to the base for exploring.